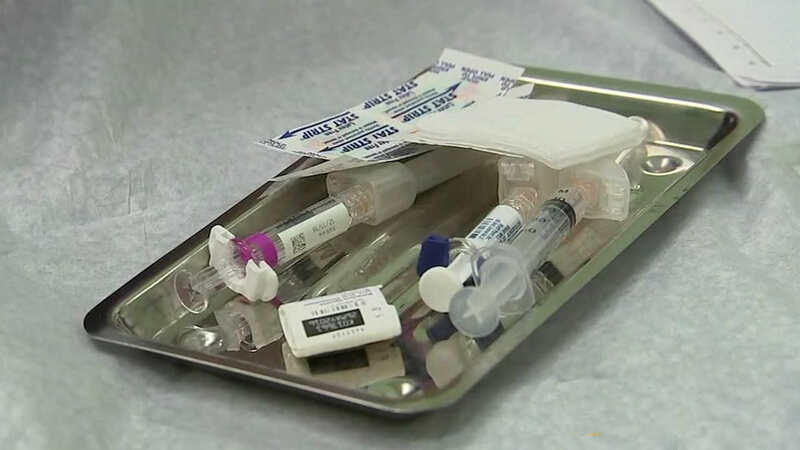 WAYNE, New Jersey (WABC) -- Officials in New Jersey announced on Monday their second case confirmed of measles in less than a week after an infant came down with the highly contagious disease. The unvaccinated seven-month-old infant had previously traveled internationally and may have exposed people in Passaic County between January 17th and January 23rd. According to the New Jersey Department of Health, the infant visited the Emergency Department at St Joseph's Wayne Hospital in Wayne on January 21st from just before 7 a.m. and 1 p.m. The infant then was taken on January 23rd to the Pediatric Emergency Department at St. Joseph's Regional Medical Center in Paterson from 6:30 a.m. to 3:45 p.m.
Officials say the child is currently recovering at home and that anyone who came in close contact could develop symptoms as late as February 15th. The previous case of measles in New Jersey was confirmed last Friday, with an adult man who had also traveled internationally and may have exposed people at several public places in Hudson County in mid to late January. In addition to these cases in New Jersey, officials in Suffolk County last week also confirmed a case of the measles in another infant who had recently been overseas. Anyone who suspects an exposure is urged to call a health care provider before going to a medical office or emergency room. Special arrangements can be made for patients to be evaluated while also protecting other patients and medical staff from possible infection. Anyone who hasn't been vaccinated or has not had measles is at risk if they are exposed to the virus.